The cowboy of the 19th century gave Texas its character. His honesty, steadiness, sense of humor, work ethic and determination, created as (the) state grew up on the range, remain as Texans’ indigenous values. In the minds of many, the Texas Cowboy is now only myth or legend, but Robb Kendrick’s Texas Tintypes manifest what is known in the soul of Texans everywhere: the cowboy remains. 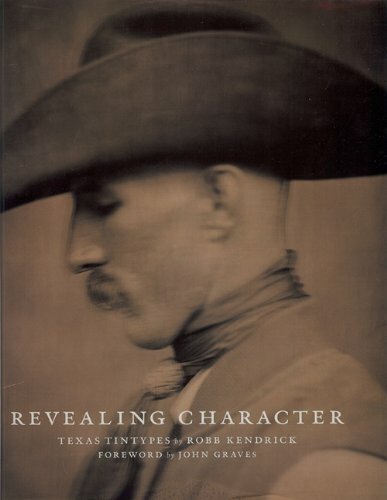 Documenting the 21st-century working cowboy in Revealing Character, renowned photographer Robb Kendrick has used the historical ferrotype or “tintype” method of photography—and allows each cowboy or cattlewoman to speak in “Field Notes” with quiet candor. Available in a print run of 3000, the limited edition of Revealing Character is bound in bonded leather, with the quadtone image from the front of the trade edition debossed on the front of the book. The slip case itself is also embossed.